I took 1,699,035 steps to travel about 800 miles. My Gear My pack weighed 17 to 28 pounds, depending on how many days of food and miles of water I carried. There was an additional 4lbs of clothes on my body. Worked much better than I ever hoped. 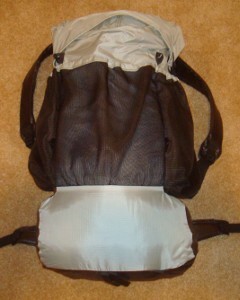 Comfortable, light, and plenty of room for all my gear. shelter 23 $75 made myself, includes plastic groundsheet and 8 stakes. Great little shelter but did not get stress-tested by any bad weather. My next one will have a few changes, but the general design is just what I like. sleeping quilt 40 $105 made myself from pattern, birthday present. Too warm most of the time! Worked super. 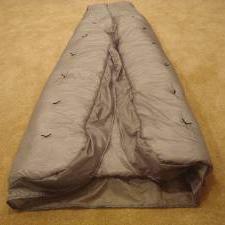 Synmat 7 UL Pad 16.2 $155 Two baffles popped, making it uncomfortable but usable. It got no leaks the entire trip. ExPed sent me a replacement when I got home! 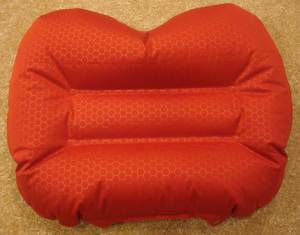 Exped pillow 2.7 $20.50 xmas present. I believe this really helped me sleep and was worth the extra bit of weight. sleeping hat 1.5 $26 made myself, xmas present. Since I had a hood on my down coat, I didn't need this. alcohol stove 1.1 $10 messier than I had hoped. Used more fuel than expected. Did not carry for last 2 weeks - no cooking. food cozy .8 $0 homemade. No complaints, saved fuel and got food soft and hot. food 0-9lb. $0 I carried 6 days of food at the most. fuel 7 $0 up to 7 oz. of alcohol, but usually less. did not work. Still more work to do on it. water filter 4.2 $51.70 Sawyer filter and raw water bag. Water bag got a few pinholes and delaminated at opening. water bottles 1.8 $16 2 1L Platypus roll-ups. soda bottles 1.2 $0 2 .6L hard. cheap, easy, light, no problems. down coat 21 $120 my big splurge. Used it every night as soon as the sun set. long-sleeve shirt 9 wore every day and the shoulders have worn through from the pack straps. BSA zip-off pants 17.2 wore every day. shoes 28 $32 one pair wore out after 450 miles. Second pair doing fine. BSA hat 3.5 wore it every day with homemade sun shield. cellphone 4.3 borrowed from friend. Worked super for blogging daily with pictures. tracker 5.1 pings to satellite with my location. Batteries lasted about 10-14 days when on for 12 hours/day. 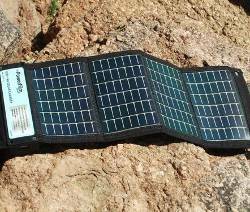 solar charger 7.3 Kept cellphone charged just fine. Stopped working in Grand Canyon and still broken. umbrella 8.1 $35 used about 8 days for desert sun. Worked wonderfully to keep cool. 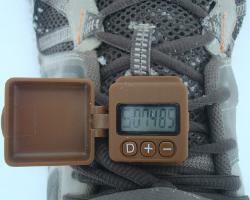 pedometer .6 $25 wore every day to track steps. rain poncho 1.7 $2 cheap disposable. Used twice in snow. maps 2 $25 up to 1 week of maps at a time. Used all the time to track location. compass 1.1 only used 2 or 3 times. toilet kit 2.8 TP, Purell - had trowel at start, but left it. trek poles 19.4 $30 inexpensive and wore out the tips. Should have lasted longer. Used to support shelter also. 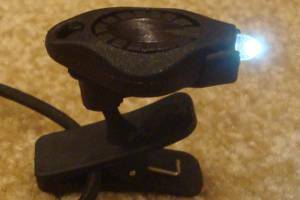 headlamp .5 $11 Awesome photon light. Batteries lasted about 12 hours, so I replaced each week. That is about 3100 calories/day. Every 3 to 6 days, I went through a town and got real food. I bought apples, oranges, bananas, sandwiches, salad, meat, pizza, milk shakes, and consumed around 6,000 calories those days. For the last 10 days, I left my cook kit behind to lighten my load and only ate cold food, replacing the dinner with 2 Snickers bars. But, I had access to restaurants and fresh food often, too. My Expenses This is very close, but I expect there were a couple other expenses. The $$/mile is high because travel to/from the trail was expensive. A longer trail would have that base cost distributed over more miles. maps - $25 - terrific mapset from simblissity.net covered the entire trail and profits go to the AZT Association. lodging - $352.48 - Patagonia $89.74, Patagonia $89.74, Oracle $42.64, Mormon Lake $58.18, Jacob Lake $72.18. Stayed with friends and Scouting families about 8 nights. fun - $486.57 - thank you meals with host families, going out on the town zero days and after trek. Total - $2350 - almost $3/mile. $2.50/mile without gear costs since I can still use that. $1.10/mile for food and lodging. Distance 800 miles - trail reroutes happen so this is an estimate of the trail length. Terrain desert with high daily temperatures and low night temperature. Travel through mountain ranges as well as many miles of fairly level plateaus. Many prickly, scratchy plants which can be hard on clothing. The trail is complete, but not well-traveled in spots. History designated in 2009 and completed in 2011. Time Window February to May. Start too early and you'll be hampered by deep snow, too late and the desert will have no water. Most thru-hikers go March through April, northbound. Time to Hike Typically takes 40-50 days. Speed record set in 2011 is 21 days. Permits Saguaro National Park and Grand Canyon National Park require permits for camping. 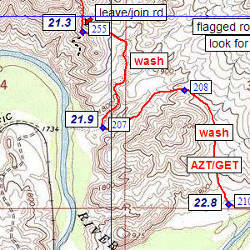 An optional AZT permit can be obtained to allow the thru-hiker to camp outside a 15-foot corridor along the trail through State Land Trust areas. Paul, It appears you are taking 2,210.8 steps per mile which means you get 2.388 feet per step. If you could increase this distance just 3 inches, you would have saved 38652 steps so far. I've just discovered your web site. I live in Phoenix and started hiking a year ago. I'm impressed with all the work you've done and appreciate your tips for a beginner. Good luck on the AZ hike! Apr 13, 2012 - L.O.T.P. 2007 A.T. When I zoom in on the map I can not see you. Please wave your arms or something. Just kidding... Your pages are so awesome! I know you're having a great time. Oct 25, 2016 - John Archuleta "Ping"
I am really interested in all the aspects of your thru hike. 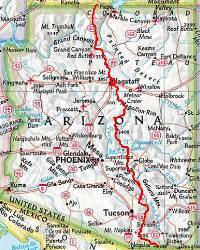 I myself just completed my first thru hike (Colorado trail) and now am looking into completing the Arizona trail in 2017. I am very interested in how you resupplied as i used the mail resupply but got bored of the same food at every resupply. @John - You should be able to find out everything relevant in my journal linked up at the top. I only sent a resupply box to Roosevelt Marina, and really didn't need to do that. 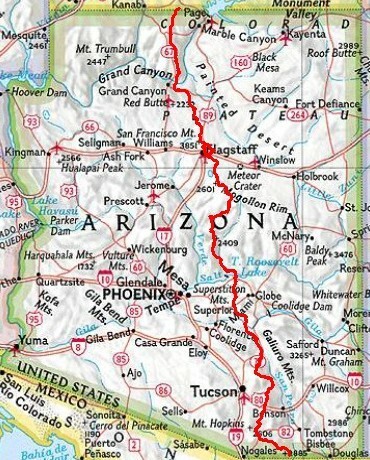 I was lucky to have rides into Tucson and Tempe, and bought food in Oracle, Pine, and Flagstaff. There were also supplemental meals in towns along the trail, like Patagonia, Colossal Cave, LF Ranch, Tusayan, and Jacob Lake.